A few times over the last two decades of life I can remember, my family has eschewed tradition and gone out to eat on Thanksgiving. There are various reasons–the holiday hit during a stressful time or half the family was traveling and it seemed silly to make a huge feast for four people. Honestly, I don’t mind going out for Thanksgiving. I’m always grateful to be with family in the presence of good food, whether it’s all of our favorites made from scratch, or an epic takeout spread made by the Chinese place up the street. This year we actually considered going out again. My mom is still recovering from an unexpected heart surgery, and we thought it might be easier for everyone to scrap the homemade feast. In the end, we decided we just couldn’t do it. You know what the deciding factor was? It wasn’t the maple roasted sweet potatoes or the party potatoes or the balsamic roasted green beans (although they all make a compelling argument). Nope, the one thing we couldn’t give up was the leftovers. You see, you can have a great meal when you go out to eat on Thanksgiving day, but what you can’t have is the day after, arguably the best food day of all. The day after means stuffing hash, waffled turkey sandwiches, mashed potato croquettes, and cranberry sauce apple crisp. Breakfast, lunch, dinner, and dessert is all taken care of with some creative re-working of your Thanksgiving haul. 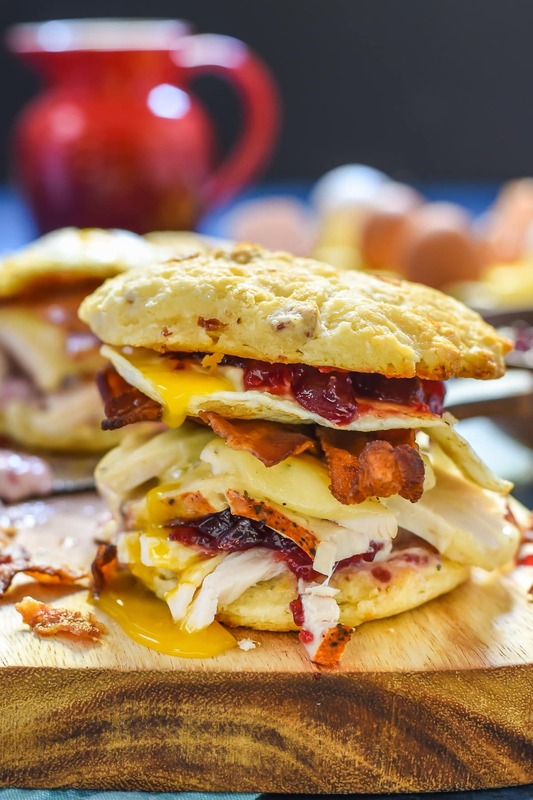 My epic leftover mashup is this Turkey Bacon and Egg Breakfast Sandwich. It’s so good, you might just want to skip the whole Thanksgiving feast and have breakfast instead. It starts with whatever leftover bread you have hanging around from the day before. I used these Honey Bacon Biscuits, but rolls or sliced bread would work just fine too. Then we layer. And slather. And stack. We start with leftover turkey bits (obviously), then cheese (also obvious), then bacon (it is breakfast after all), then an egg (see previous comment + what isn’t improved with a fried egg? ), and finally a generous dollop of cranberry sauce and mayo. Guys, does this sound weird to you? Because I get that some of you might look at all of these things and think to yourself, Ummmm, no. You crazy, Courtney. In fact, I knew my husband would be one of those people. His hatred of mixing fruit and savory foods is well documented, which is why I purposely didn’t tell him what was in these sandwiches before we ate them. Guess what, guys?? He LOVED it. I mean, really, truly LOVED it. We both did. This sandwich works. 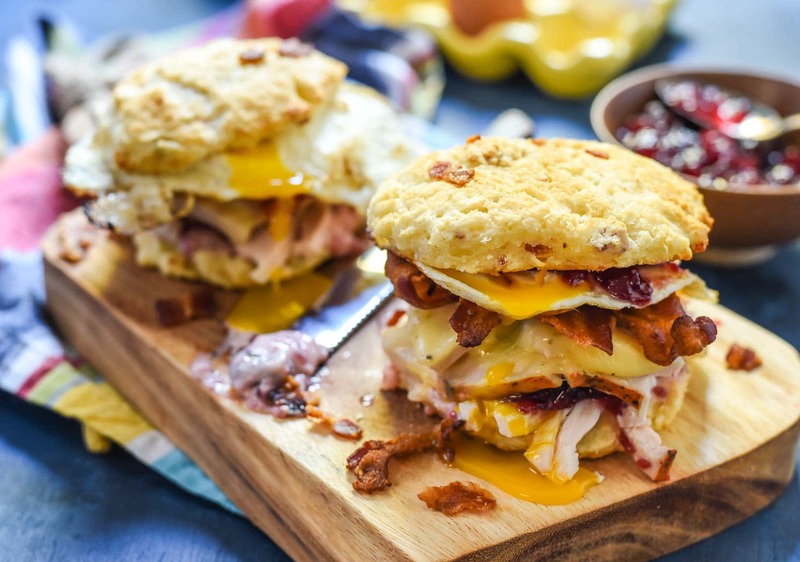 Everything together–the savory bacon and turkey, the melty cheese, the drippy, smooth egg, the pop of tart sweet cranberries–it all comes together to make one heck of a good sandwich. 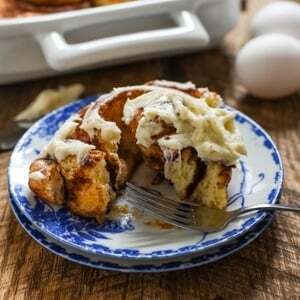 This will fuel you for a morning of feverish Black Friday shopping or a day of loafing on the couch. Your choice. Either way, make sure you save some leftovers for this beauty! 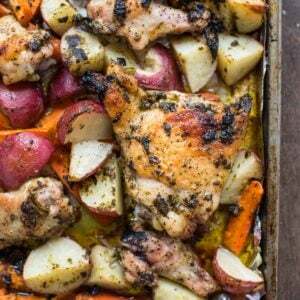 Speaking of leftovers, If you want to make sure you have leftovers (which I know you do! ), plan for 1 1/2 lbs. of turkey per person. Reheat your leftovers to 165 degrees and be sure to finish them up within 3-4 days. For more turkey tips, be sure to follow the Ohio Poultry Association on Facebook, Twitter, Pinterest and Instagram and join me TONIGHT for an Ohio Talks Turkey Twitter party from 9-10 p.m. EST! We’ll be chatting about answers to common questions, from buying a turkey to thawing, prepping, cooking and serving. Win everything you need to make a full Thanksgiving feast, including a Turkey Fryer, Oven Roaster, Carving Set and much more! In a skillet, fry the bacon until crispy. Remove to a paper towel lined plate and set aside, reserving the bacon grease for later. In a small bowl, whisk together the cranberry sauce, mayo, and lemon juice. Season with salt and pepper to taste. Split your rolls or biscuits in half then spread with cranberry mayo. 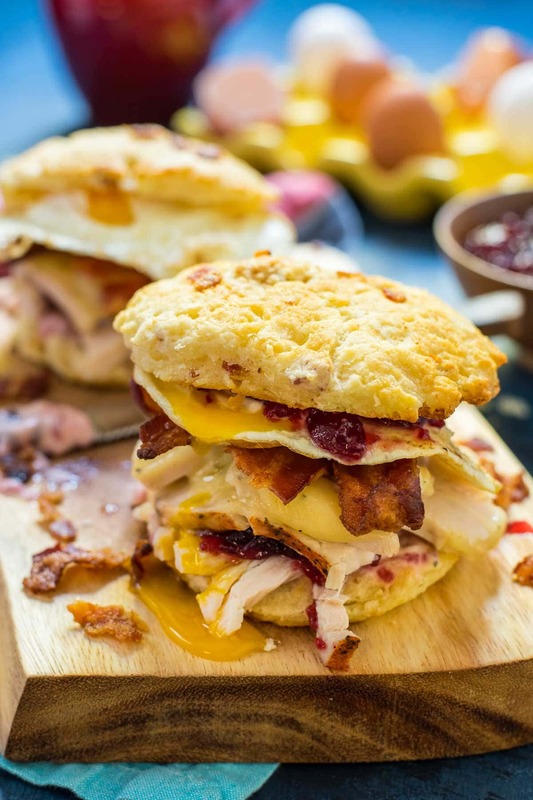 Stack with turkey pieces, cheese, and bacon and top with the top half of the biscuit or roll. If you’d like to serve the sandwiches warm, microwave or pan fry the turkey with the cheese before adding to the sandwich. Meanwhile, fry the eggs in the leftover bacon grease over medium heat until set on the bottom. Flip, and fry another 30 seconds to 1 minute for an over easy, dippy egg. Place an egg on each sandwich and serve. This post was developed in partnership with the Ohio Poultry Association. As always, all opinions are my own.